The story: This 17-year-old bourbon, set to debut in August 2015, is Eddie Russell’s debut after being named Wild Turkey co-master distiller alongside his father, Jimmy Russell. Its story began in 1997, the distillery says, when Wild Turkey had more bourbon than it had storage space and Eddie arranged with another distiller for space in some empty stone warehouses. After several years there, the barrels returned to Wild Turkey’s wooden warehouses for further aging. When the barrels were dumped after a total of 17 years, the bourbon registered a much lower proof than expected: Barreled at 107, it was 89 proof, and 86.8 when bottled. Its color was also much lighter than you’d expect from a 17-year-old bourbon. Both the proof and the color can be attributed to the whiskey’s time in those stone warehouses, where temperature variations are not as great. 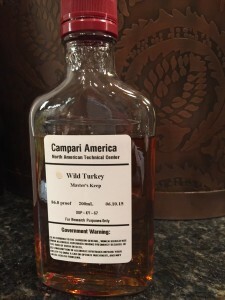 Wild Turkey provided The Bourbon Babe with a media sample of Master’s Keep for review; here are my tasting notes. The aroma: Pleasantly smoky, with oak, vanilla and butter and a very bright citrusy note — more citrus oil than fruit. The taste: Creamy mouth feel; coats the entire palate. Sweet caramel with an undertone of that smoky oak; citrus on the end and a long, very smooth finish. The verdict: This is an exceptional bourbon. I tend to agree with Jimmy Russell, who’s told me many times that once a bourbon gets over about 12 years, it starts to lose the sweeter flavors and picks up too much of the oak. But at 17, Master’s Keep is a notable exception. There is some oak, for sure, but there is no tannic bitterness, and it couldn’t be smoother. I wouldn’t pay $150 for a lot of bourbons, but this is definitely on the list – and I look forward to seeing what Eddie comes up with next. 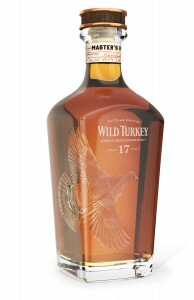 where can I find the wild turkey masters keep on line to purchase. That’s a tough one. Binny’s in Chicago has a wide selection but can’t ship liquor… any ideas, anyone? I was really excited about this one. Finally got a chance to pick one up and wasn’t disappointed. Delicious. Went back and bought two more bottles.